I must admit, we were somewhat skeptical going into an activity where the instructor had written an e-mail to us prior to class with a signature of "Happy Shimmies." However, the "Happy Shimmies" woman proved to be probably the best instructor we've come across in this whole dilettante world we've created. 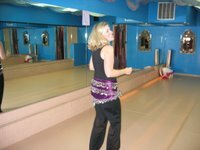 Of course, she had an amazing belly-dancer body, and this, combined with full-length mirrors around the perimeter of the room, made us that more anxious to follow up this activity with a lot of margaritas. Best of all, the class lasted just an hour. Long enough for us to realize that belly dancing is a workout and not as easy as it looks, and long enough to be able to put moves together into something that resembled a belly dance. Just about the perfect dilettante activity. The evening ended with a couple of pitchers of margaritas and some Mexican Food at a place around the corner.